Russian financier, philanthropist, and communal worker; born in Wilna Nov. 16, 1817; died in Locarno, Switzerland, June 19, 1887. His father was a progressive, scholarly merchant whose house was one of the rallying-points of the Haskalah movement early in the nineteenth century. 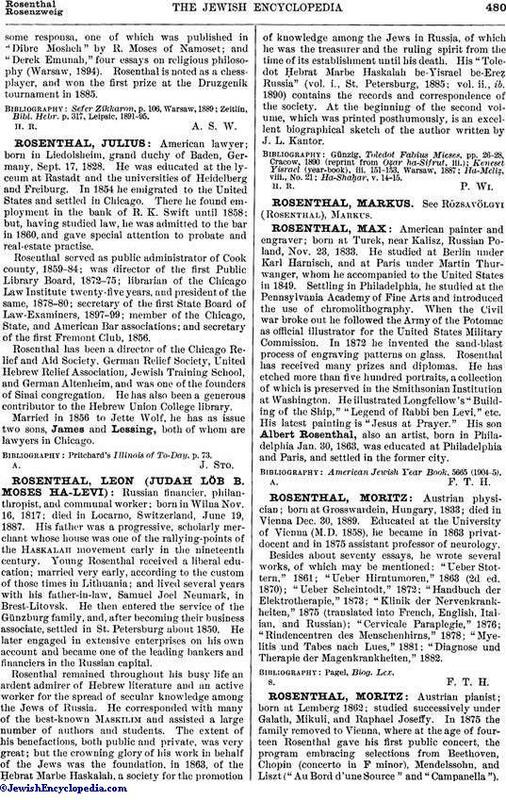 Young Rosenthal received a liberal education; married very early, according to the custom of those times in Lithuania; and lived several years with his father-in-law, Samuel Joel Neumark, in Brest-Litovsk. He then entered the service of the Günzburg family, and, after becoming their business associate, settled in St. Petersburg about 1850. He later engaged in extensive enterprises on his own account and became one of the leading bankers and financiers in the Russian capital. Rosenthal remained throughout his busy life an ardent admirer of Hebrew literature and an active worker for the spread of secular knowledge among the Jews of Russia. He corresponded with many of the best-known Maskilim and assisted a large number of authors and students. The extent of his benefactions, both public and private, was very great; but the crowning glory of his work in behalf of the Jews was the foundation, in 1863, of the Ḥebrat Marbe Haskalah, a society for the promotion of knowledge among the Jews in Russia, of which he was the treasurer and the ruling spirit from the time of its establishment until his death. His "Toledot Ḥebrat Marbe Haskalah be-Yisrael be-Ereẓ Russia" (vol. i., St. Petersburg, 1885; vol. ii., ib. 1890) contains the records and correspondence of the society. At the beginning of the second volume, which was printed posthumously, is an excellent biographical sketch of the author written by J. L. Kantor.